It's probably still a little early for Christmas but it's not too early to start doing a little shopping preparation. Today, I want to review a book written by Mark Couturier who was diagnosed with Asperger's syndrome at 19 years. Mark was born in Seoul, Korea and raised in Greenville, Michigan. I earned a B.A. in history at Grand Valley State University and briefly worked as an aid worker in Kabul Afghanistan. 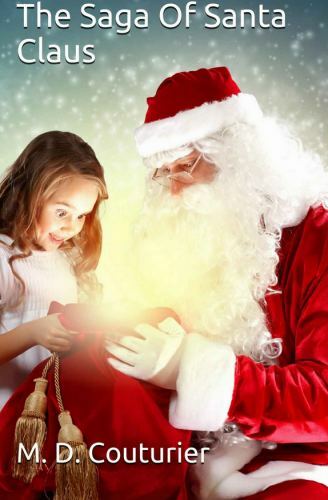 The Saga of Santa Claus is a seasonal tale aimed at the young and the young at heart. Over the years, there have been many retellings and versions of the origin of Santa Claus, the reindeer and all of the various Christmas traditions. My personal favourite will always be the Bass and Rankin "Santa Claus is Comin' to Town" TV movie from 1970. Of course, that's because I watched it every year as I grew up. Kids are always interested in Santa's origins and these quite often become a family annual tradition which stays with you for your entire lives. While there are plenty of movies on the subject, there's not a lot of books - and nearly all of the books are picture books. The Saga of Santa Claus is not a picture book. It's clearly aimed at young children but there are a couple of more mature themes (two characters who die). While this is important to the story, it does mean that the reader/listener's age probably needs to be around six to eight years depending upon maturity. At 40 pages, it's a little too long to read aloud to your child in one sitting but it is broken up neatly into chapters and this would make it an ideal book to read to the kids at bedtime in the week leading up to Christmas. While it covers the usual topics, how Santa got his name, his reindeer, the elves, the north pole location and the sleigh, it does so in a very unexpected way. It's a much more sobering story than what they show on TV and it's full of emotion. You won't be able to read this without a tear in your eye. There's one section, right near the end of the book, where just prior to his annual journey, Santa reads out a letter from a chosen child. If you're reading this book to your kids, this is the ideal spot to swap the books' words out for your child's own letter for a bit of "home magic". The Saga of Santa Claus presents an unexpected and deeply emotional story of the origins of Santa. I'd wholeheartedly recommend it to anyone with young kids aged around six and up. It's a great book that will quickly become an annual tradition in your house. The Saga of Santa Claus by M. D. Couturier is available in Paperback and Kindle format from Amazon.and from Good Reads.